(CANCELLED) HALLOWEEN HD "Nightmare on 7th Street"
THE FIRST ANNUAL HALLOWEEN MUSIC EVENT, with 2 stages, Swedish Egil from Power 106, and special guests with local headliners (listed below). V!P comes with no-wait admission to the Largest Haunted House & Hayride, at the San Bernardino Fairgrounds in Victorville, CA at Roy Rogers Drive @ The 15 Freeway. Check out the High Desert's Largest Haunted House & Hayride, then stay for a WICKED COSTUME CONTEST. 18+ over to enter, with Full-Bar for 21+. GO-GO DANCERS IN COSTUME, INTERNATIONAL FM RADIO DJS FROM POWER 106 LA's POWER TOOLS, AND MORE!!! VIP ONLY $30 PRESALE - Includes haunted attractions, event, and backstage access with VIP bar. Bottle Service Available for 4-8 Guests. Text 714,900.3987 to RSVP. Fully Themed Event, with props and go-go risers throughout the event. Get your costume, and get your freak on! Halloween HD has hit the spot, and the San Bernardino Fairgrounds will pop! Give Aways from PANIC39 and HIGHER THOUGHTS. Check out the video on our comments, so you can see how we do from OC-LA. This event will feature OVER 60,000 WATTS OF AUDIBLE ELECTRO! Fully automated light show, trussing, lasers, special effects and confetti... With full size Halloween props throughout the event. Tons of photo-ops to remember your night, and over 9 well known and highly regarded Massive, Club, FM Radio, House Party DJ's who rock the spot. 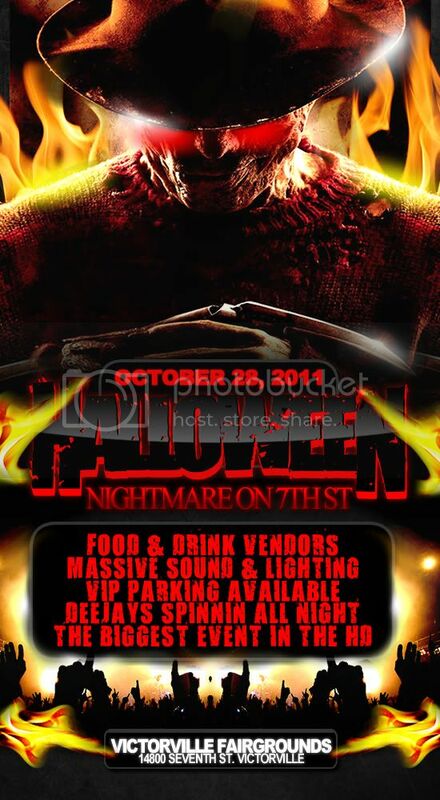 It's all going down October 28TH at A HUGE LEGITIMATE EVENT FACILITY!!! This event will not be held at your typical nightclub, as you see it being transformed into the "Pumpkin Massacre Theme Party" - known as HALLOWEEN HD! "Nightmare on 7th Street!" !! !SPECIAL EVENT ONE NIGHT ONLY!!! 6PM - 2AM - 1000+ Capacity. -Standard Haunted Attraction Hours are 7PM-10PM (Thurs+Sun) and 7PM-11PM (Fri+Sat). GRAND OPENING as of Friday, October 14th & 15th, hours are 7PM-11PM. Join us and be able to walk out of the haunted house and enter the largest Halloween dance party in the entire desert! This event will feature one massive stage with full lighting and sound and one of the TOP POWER 106 RADIO DJ's coming out to spin just for you!!! Anyone 21+ will be welcome to our full bar with valid ID! Tickets are available now so make sure to pick yours up today!!! Possible 2nd Area TBA with Dubstep and Jungle. Show some hype in the comments to support, and if we see over 30 people interested via comment and attendance, we will add a 2nd Stage with BASS MUSIC!!! Costume Contest with $200 Value Give-Away for Halloween Night (10/31/11) and Clothing Give-Aways for runner ups. $30 VIP Combo includes entry to Haunted House & Hayride, and event. $20 Express Entry to Haunted House (before 10PM) event entry included. $15 General Admission to Event (between 8PM - 10PM) event entry only. $12 General Admission to Event (before 6PM - 8PM) event entry only. $10 Presale Tickets (Street Promoters & DJs) event entry included.